It’s not what you know … it’s who you know. That old adage is viewed by some as unfair and cynical. If that’s how you read it, get over it because it is proven time and again that you will enhance your success both personally and professionally by “knowing and being known”. There are two ways to network: do-it-yourself (DIY) or pay-to-play (dues paying groups). In this article, we’ll visit both paths with an eye to delivering comparable facts for you to decide the route most comfortable for your unique personality and networking preferences. Alert: Don’t prejudge. Enter all contacts. Exclude no one, as you never know how a positive relationship may develop. One further thought. Everyone you meet may not be a valuable contact in pursuit of your networking goals, but may well be capable to introduce you to others that are. Service groups are easily identified, i.e. Rotary, Kiwanis, Lions, etc. Certainly, visiting several is a worthwhile introduction to the world of networking and a lesson in contributing to causes without expecting immediate personal reward. Talk with others that you know who network and add their groups to your list. Often, participation will be based on an invitation from a member to be a guest at a meeting. So, keep your ears open and ask around to identify opportunities. Visiting a variety of networking organizations will help you to identify those that best fit your profile, plus provide opportunities to practice and hone your networking skills. Develop and practice your “elevator speech” – a 30 second description of what you do for a living with an emphasis on how you bring solutions to pain points. Old saying, “If you don’t follow-up, you’ll foul up” – an email, handwritten note or small gift depending on the circumstances. Stay in touch … ideally with information that will be valuable to the person, e.g. industry news, a new development affecting her business, etc. 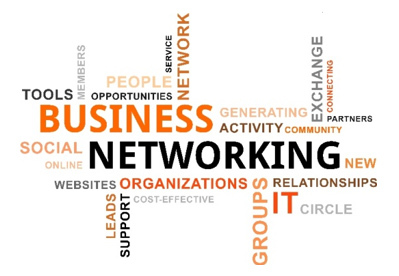 In this digital age your networking activities must include social media. Your choice should be consistent with the audiences you want to reach and that you will devote time to nurture. Certainly, if your business is B2B (business to business), a presence on LinkedIn is a must, as well as joining appropriate LinkedIn Groups. B2C (business to consumer) are likely to find pay dirt through Facebook and Twitter. There are others and additions seem to crop up weekly. So be alert to the current social media landscape and participate appropriately. In Central Virginia there are four networking groups that provide support and referrals to dues-paying members. All are similar in some respects, e.g. limits on number of members; attendance requirements; and structure of meeting agenda. Here’s a brief introduction to each. PRO emphasizes that members meet with their Team of Strategic Partners with the goal for every member to leave every meeting with actionable items that will help their business move forward. The Synapse stated mission is to help businesses and nonprofits in communities across the U.S. connect with one another to foster greater economic and community development. Two Twelve derives its name based on the boiling point of water. At 211 degrees, all you have is hot water. At 212 degrees, you now have steam that can move locomotives, drive industry and generate significant power. The “granddaddy” of dues-paying network groups. Founded by Ivan Misner, BNI is best described by its motto, “Givers-Gain”. Pay-to-Pay groups may be a way to initiate or expand your networking efforts … particularly if you are new to the Central Virginia market and/or are initiating your networking for the first time. Note: In a tribute to the RVA professional community, PRO Richmond, Synapse and Two Twelve were developed by Richmonders who took the BNI idea and tailored groups each dedicated to networking with a specific point of view. A tribute to RVA creativity!